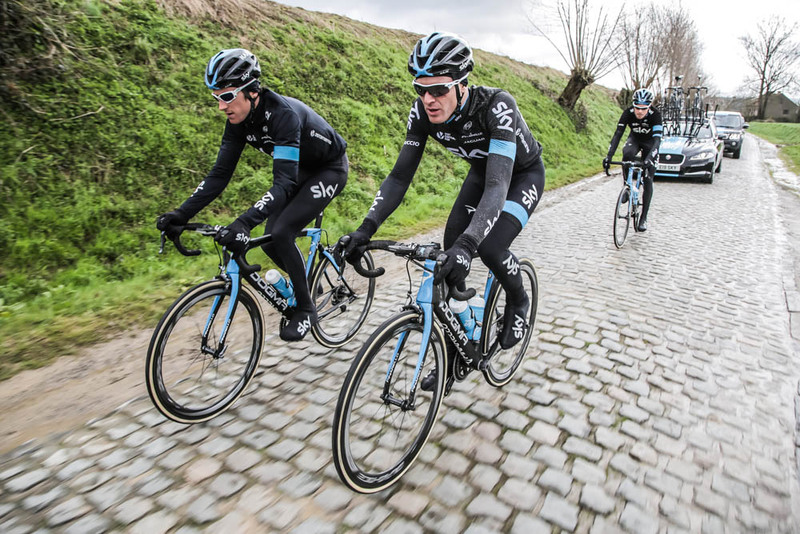 Team Sky has unveiled its secret weapon for the forthcoming Tour of Flanders and Paris-Roubaix: a special edition Pinarello Dogma equipped with cobble-smoothing suspension co-engineered with the help of car manufacturer Jaguar. 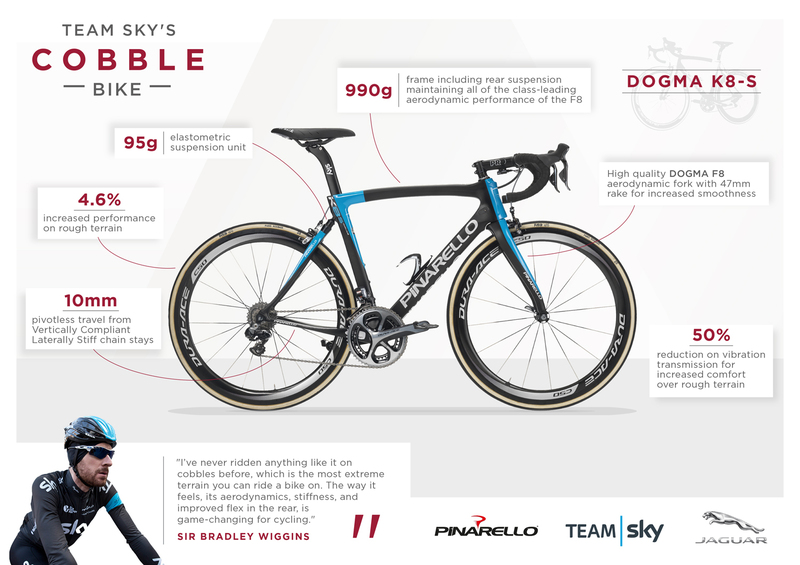 Bradley Wiggins, Geraint Thomas and Sky team-mates will debut the carbon-fibre Pinarello Dogma K8-S at the Tour of Flanders on Sunday (April 5). The bike features a shock at the top of the wishbone seat stays, which they are calling DSS 1.0 or the Dogma Suspension System, affording 10mm of movement. This is designed to soften the blow of riding over cobblestones and help keep the rear wheel tracking over rough surfaces. Wiggins and team-mate Christian Knees tested out the new bike in March, using the cobbled sectors in the final 130 kilometres of the Paris-Roubaix route as a test bed. The bike has apparently undergone months of testing and performance analysis to ensure it is ready for the Classics. According to the team, the frame weighs in at competitive 900g. To accommodate the movement of the rear end, Pinarello and Jaguar have created flexible, flat carbon fibre chainstays. 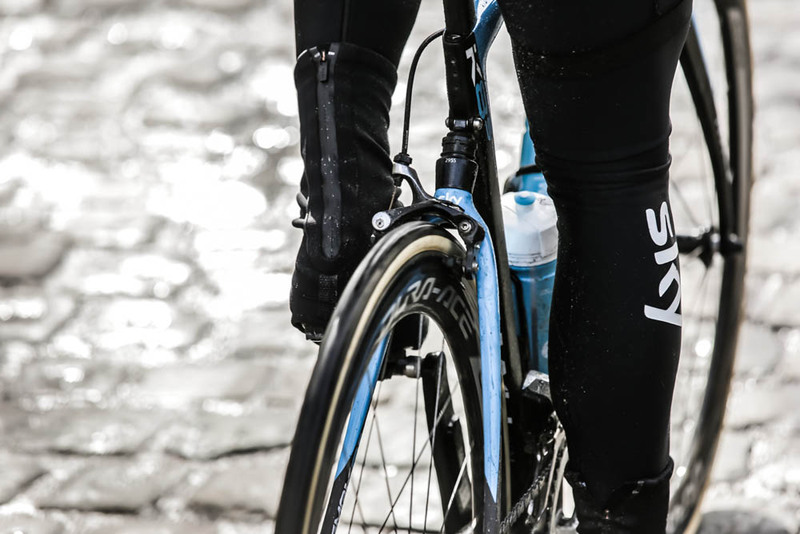 Figures produced by Jaguar show that the new K8-S frame helped ‘create an overall performance increase of 4.6% and 50% improved comfort for the riders over rough terrains from the previous Dogma K model’. Wiggins has said that he’s a fan of the new frame: “I did all the testing in the winter on the prototype, all the recon in Roubaix, the difference is unbelievable, it’s hard to describe until you are on it hitting the cobbles at full-tilt in Arenberg. This thing changes the whole feel, it’s the first bike that’s made for the race, in terms of aerodynamics. In the past, they added RockShox and other things, but never to this degree with that much time and attention. “When you get to the end of Carrefour and everyone’s dead, of course, you also have to have the legs, but the bike will make the difference to get there. Sir Dave Brailsford – famous for his theory of marginal gains – added: “We’ve been able to knit together Pinarello’s world-class knowledge in bike design and Jaguar’s industry-leading technological and engineering expertise, with a proven winning team of riders and experts in human performance, to come up with something truly ground-breaking. Thomas goes into Sunday’s Tour of Flanders as one of the leading favourites, having won E3 Harelbeke and placed third in Ghent-Wevelgem last Sunday. Wiggins has also hit good form ahead of his tilt at Paris-Roubaix on April 12, having won the final time stage of the Three Days of De Panne. It’s not the first time that teams have employed suspension technology to try and conquer the cobbles of northern Europe: mountain bike fork manufacturer RockShox produced its Paris-Roubaix suspension fork, which was famously used by Gilbert Duclos-Lasalle to win the race in 1992, then again in 1993. Andre Tchmil also won on a bike with the RockShox fork in 1994. 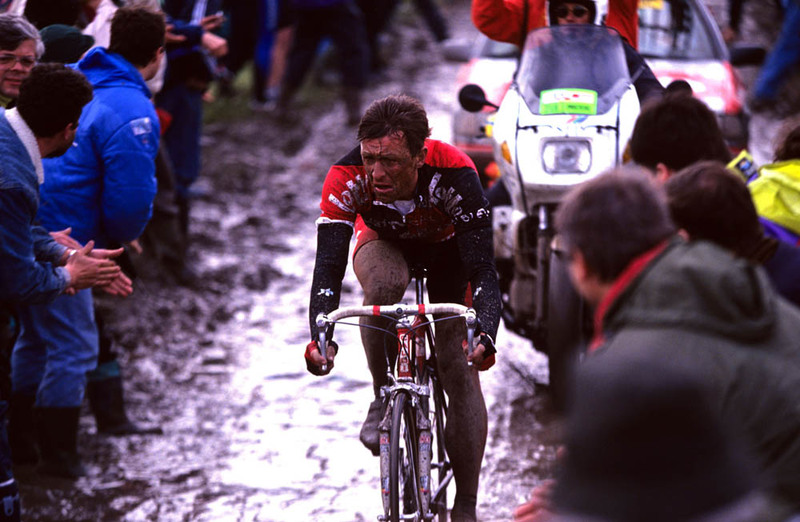 A full suspension bike created by Italian company Bianchi, complete with pivot points and a coil rear shock, didn’t fare so well, with the frame failing during the 1994 Paris-Roubaix under Johan Museuuw. Technical problems and rivals winning on rigid bikes saw suspension fade out of the limelight. More recently, Specialized has had recent with its Roubaix line of bikes that use viscoelastic ‘Zertz’ dampers built into the frameset to absorb bumps, which has since made them popular with the leisure market. Several other manufacturers have since included similar damping systems in their Roubaix bikes but none quite as bold as the Dogma K8-S.